Cooking is excellent. Homemade meals can really be delicious, while also being healthy and nutritious. By selecting the finest ingredients, anyone can create incredible meals to enjoy with our friends and family. However, eating out does have its own special charm. When you select a great restaurant, you will be able to taste amazing dishes, feel pampered and relax. We are here for you here at Spamps. Let’s check out what is on the menu here. Our restaurant takes great pride in serving freshly baked cakes and the finest steaks. There are numerous other choices of food that are available, but we highly recommend that you try out those two options at least one time. A fine steak is basic yet stylish. For a business meal or romantic dinner, it is one of the best choices possible. The ideal steak requires the finest quality meat. This is something we know very well, and that is why we will never compromise. We only work with the very best suppliers who provide us with grass-fed beef only, so that our customers can feel completely spoiled from the very first bite up until the final one. Our chef is an awarded and internationally renowned expert. To prepare our steaks, he uses the finest cast iron skillets, that allow him to create the same ideal taste with every single order. Whenever you visit us and order one of our steaks, you can be certain that it will always have that same delicious flavor and delicate texture that will melt inside of your mouth. The side dishes are also incredible. You have the option of butter asparagus, baby spinach, crispy potatoes, or our vegetables of the day. 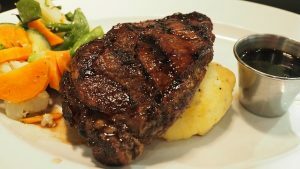 Also included on our list are salad, baked potatoes, and French fries, so all you need to do is tell us what your favorite side dish is and let our chef impress you with the freshness of all of our ingredients and the savory flavors of the best herbs and dressings that are some of his closely held secrets. We also have a fine selection of both international and local red wines. No matter what your personal preferences happen to be, we have at least a few wines that will match them. That juicy steak of yours will have great company from a glass of the best wine from our cellars. And if all of that was not enough, we offer freshly baked cakes which are the ultimate temptation that is nearly impossible to resist. You will be hooked on them for life after that very first bite. 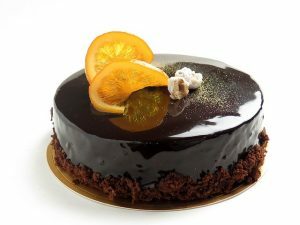 Your second bite will follow automatically, and you will have your cake finished without ever having had the chance to order that glass of sweet wine to go with it. We have all of the flavors covered, since we prepare everything in-house, using all of the highest quality ingredients. Our pantry is loaded with the finest sweet-sour berries, juicy pineapple, dried apricots, and cherries. These are all for our guests’ pleasure, along with are incredible icing which has elevated our restaurant one level up in the fine dining world. We also have cookies and different pastries that are available all the time in our restaurant. We make sure to keep them fresh by using quality Food Packaging Machines. Nothing pleases us more than seeing our guests happy. That is why we strive at all times to not just meet but exceed their expectations. We are successful most of the time, so we frequently see them returning and bringing in new people with them for dinner. We are hoping to have the honor of you coming in for dinner. If you are able to give us a call and get your reservation booked in time, we will be honored to serve our very best table for you. We have carefully chosen the finest cuts of meats and they are ready and waiting to be turned into the finest steak to put on your plate. Great food is pure happiness. We really understand this and are very happy to allow our customers to discover this for themselves. With every bite you take, it will take you one step closer to being in Nirvana. That way, by the time you get to dessert, you will be on cloud nine already, and be prepared to speak with all of the gods. Allow us to guide you towards happiness with one of simple, high-quality meals that will delight your senses and warm your soul. Call us today to make your reservation.